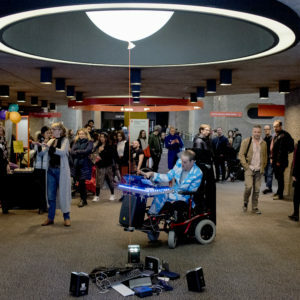 On 17 March 2017 Drake Music hosted a special event showcasing a series of original commissions as part of its Connect and Collaborate programme working with disabled artists. 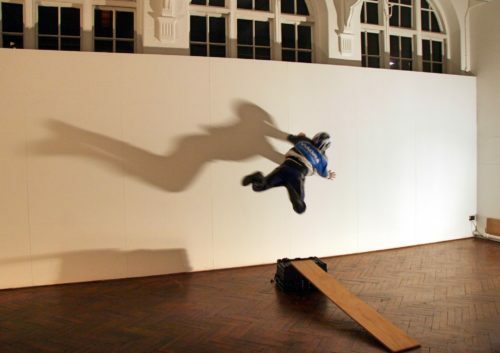 The event took place at the Institute of Contemporary Art, London. Review by Mik Scarlet. For many years, I have been associated with Drake Music, and have worked on several music projects through them. Their drive to open up the joy of making music to everybody is something I wholeheartedly support, and through my relationship I have witnessed some special moments, making some amazing music along the way. Nothing can surpass seeing someone discover that they can make music for the first time, thanks to Drake Music’s technical knowledge of applying assistive technology to the creation of music. The only thing that comes close is experiencing the end result, as those newbies become fully fledged musicians. 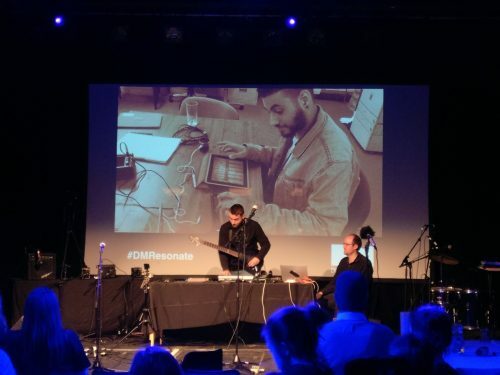 The DM Resonate gig at the ICA allowed some of those musicians to showcase their talent by performing the fruits of their relationship with Drake Music. I was lucky enough to be in the packed audience. 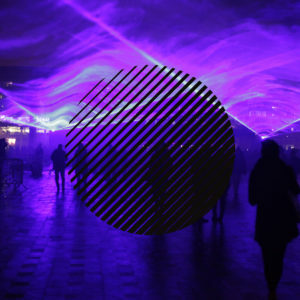 This one-off event was billed as an eclectic mix of live music and visuals from up and coming artists from across London, and eclectic it was. The night touched on everything from metal to modern classical. Proceedings kicked off with a three-song performance from a band formed out of members of DM Collaborate. This is a Drake Music-funded monthly meet up of disabled musicians, allowing them to chat, support each other, organise future projects and jam. The set opened with a jazz-influenced free form classical piece that accompanied a beautiful film by a member of the group, Oliver Cross. It was stunning, but there was even better to come. Next came a dance-inflected jazzy number, and the last track was a totally improvised four to the floor country dance track, that rocked the room. 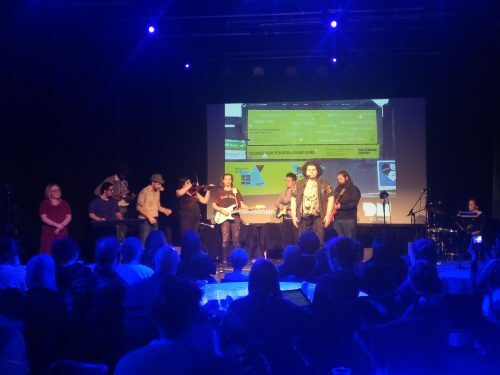 The DM Collaborate band created some rousing sounds, despite only getting together for a few hours a month, and the improvised end number showed the skill on the stage. It set the night off on a cracking note. This was followed by a short film that highlighted Drake Music’s work promoting the ethos that music-making really is for all. It demonstrated how their application of AMT (assistive music technology) opens up the joy of making high quality music to new practitioners, and how music can change lives. Seeing the sheer delight on the faces of the younger people in the film took me back to the thrill I felt as I learned to play. After the film, Daryl Beeton, our host for the evening and Drake Music’s associate national manager, announced the next four performances would be from major partnership commissions. The first came from Royal Boil Alice with ‘Echoes In Time’, a commission with the Southbank Centre which captured the feel of the brutalist architecture of this cultural icon beautifully, with a thumping slice of experimental prog rock. It got the room going for sure. Cinarama used audio cut ups and video in the piece ‘Vocal’ to capture a day in the life of circus group UpSwing, as they work with a group of older people at one of their workshops. A real uplifting piece. Things then got right up my street, as Andreas Lopez-Muro Alfaya Y Frias combined assistive music technology with heavy rock in his piece, ‘Emerge’. Created in partnership with WAC Arts, this was a stomping piece of technorock, that took both genres in a new direction. The final piece, commissioned in partnership with the London Philharmonic Orchestra, from composer Lucy Hale was my personal highlight. The video of a quintet of members of the orchestra performing Lucy’s ‘In The Wind’, loosely based on Yeats’ poem ‘To A Child Dancing In The Wind’, was breath-taking. Ms Hale is definitely a talent to watch. DM Resonate was a triumph. 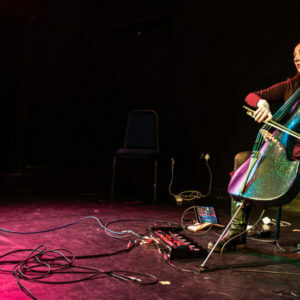 The journey of Drake Music, from music therapists to supporters of highly skilled disabled musicians, charts the wider journey of all disability arts. 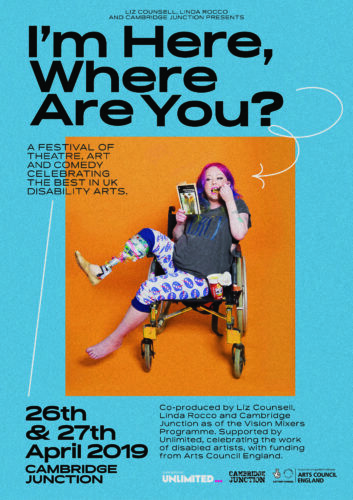 Each performance was of the highest quality and proves that given the right support and assistance disabled people can create some truly stunning work. Click here for more information about Connect and Collaborate, including upcoming events.